I cannot tell you all how many times I have tried to tackle the problem of storing my eyewear. Side note: if you don’t already know this about me…I have A LOT of eyewear (one of the job perks). Now that my secret is out I feel much better, so let’s get back to business. Having so many beautiful pairs of eyeglasses and sunglasses but nowhere to store and/or display them has always been an issue for me. As much as it pains me to admit, my eyewear drawer looked like something out of TLC’s Hoarders. At one point I was considering getting a sign that read, “Open at your own risk”. It seemed like no matter how many times I would empty and organize it, the drawer was just a mess and extremely bothersome to sort through. By the time I found the pair of frames I was looking for my prescription had changed (haha). I have scoured every store, optical magazine, and Pinterest board for a solution that was not only functional but pleasing to the eye. 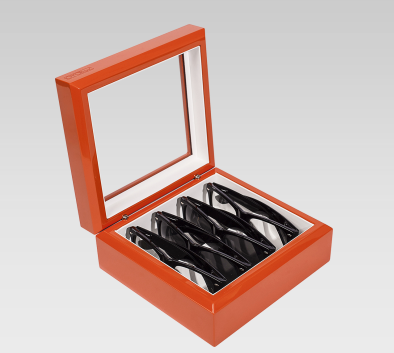 The Original OYOBox will fit up to 6 pairs of your favorite eyewear whereas the newly released mini will fit up to 4. 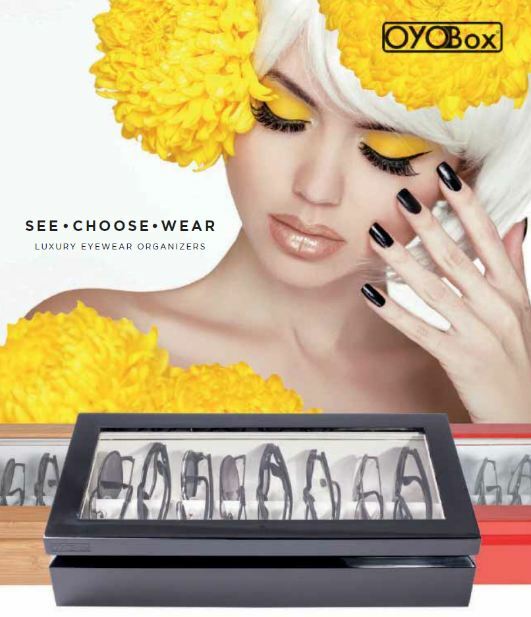 Each OYObox is hand crafted and features stainless steel ball hinges and a shatterproof top window. 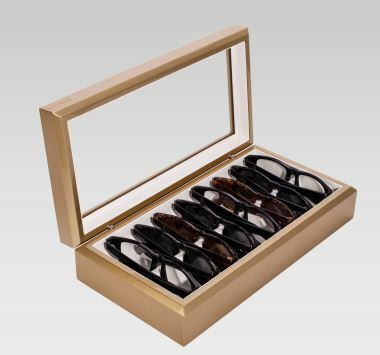 Down the center of the box is a specially engineered partition to perfectly house your eyewear, and is lined with the softest leather. The OYOBoxes are available in not only wood finishes but also an extensive selection of vibrant colors. Did I mention that they apply SEVEN layers of lacquer finish? No, well they do…and it is meticulous. The look and feel of these OYOboxes is nothing short of luxurious. Every time I think they cannot get any better, they blow my mind with a new release. This time it was a metallic gold full size box (pictured) …Where is the emoji with the heart eyes when you need it! One of the best things about this company is that it continues to expand; offering more exquisite finishes, different size boxes, and accompanying (and equally as beautiful) jewelry boxes. 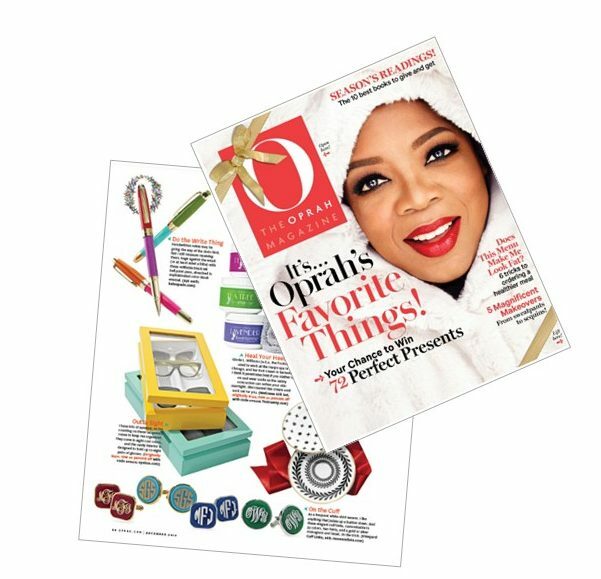 At a very reasonable price point of $165-$350, they make the perfect gift for the eyewear lover in your life, even if that’s yourself. I have many patients display them not only in their bedroom, but in the common areas of their home. Why would you not want to display something that not only contains beautiful objects, but itself is exceptional? It is time to show off and be proud of the eyewear that you have, not hide them in your bedside table, or in my case a drawer that needed a trained professional and a ton of emotional support to sort through. You can find more information on the “Collection” page of this website or visit our store!